Protect your converged networks from known and unknown risks! This Avaya limited edition of VoIP Security For Dummies shows how risks are identified, analyzed, managed, and minimized in your converged voice and data networks. Find out how security best practices — and Avaya products and services — can make your VoIP network as secure as a traditional telephone network. IT managers will appreciate the jargon-free coverage of VoIP and converged network security, and end users will easily understand the benefits of securing VoIP. See how an Avaya solution can help you implement VoIP without sacrificing the security and stability you are accustomed to. This is a private-label book that is not available in stores. You must contact Avaya directly to obtain this book. Download a presentation on VoIP Security that was presented at the 2007 SecureWorld Expo conference in Seattle. This site is not affiliated with John Wiley & Sons, Inc., the publisher of VoIP Security For Dummies® by Peter Gregory, CISA, CISSP. VoIP Security For Dummies is Copyright © 2006 Wiley Publishing, Inc. All rights reserved. Reproduced here by permission of Wiley Publishing, Inc. For Dummies, the Dummies Man logo, A Reference for the Rest of Us!, and related trade dress are trademarks or registered trademarks of Wiley Publishing, Inc. in the United States and other countries. 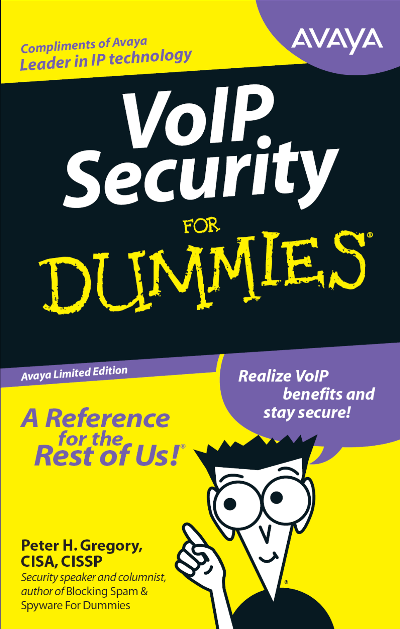 To get a copy of VoIP Security for Dummies, you need to contact your Avaya sales rep or click on the “Download” link on this page. Thanks!